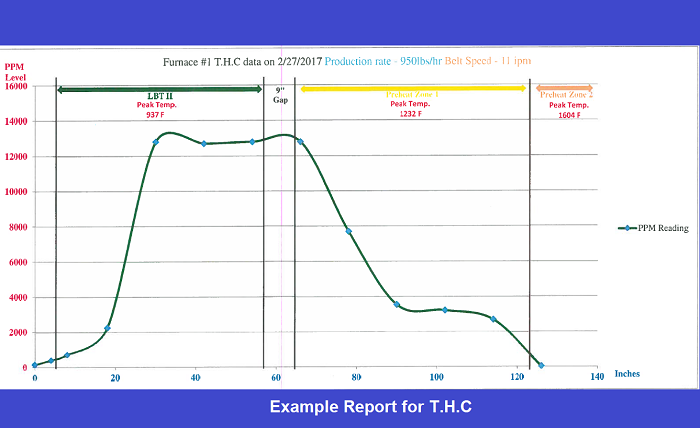 The T.H.C analyzer allows TAT to determine where lubricant vaporization begins, peaks and at what point delubing is complete. This lets us make recommendations that can be implemented in the preparation section of a furnace. Once made, these adjustments should result in faster, more complete delubing and effective destroying of hydrocarbons before entering the atmosphere. VSD - Vaporization, Sweeping, and Destorying of the hydrocarbon before exiting front of furnace.